Visitors view exhibition plots at Cereals in Practice 2018. 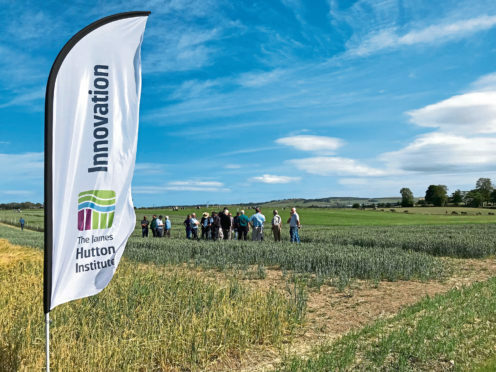 Winter barley has historically made little impact on the Scottish malting market but that could be about to change, according to Dr Bill Thomas of the James Hutton Institute (JHI). He told growers at the Cereals in Practice event, held at Saphock Farm, Oldmeldrum, that the Impromalt project was proceeding well and it was proving possible to incorporate spring barley quality into much higher yielding winter varieties. The advantages of such an approach were very obvious this year with spring barleys throughout Scotland under stress while winter types looked much more resilient. “We don’t produce enough malting barley in Scotland. The demand for the important whisky industry is about 1 million tonnes per year but we can only produce about 750,000 tonnes domestically with the rest coming from England or elsewhere,” said Dr Thomas. The new varieties on trial have been produced by conventional crossing but recent advances in molecular marker technology have made it possible to precisely identify the relevant genes. The Impromalt project involves a consortium of UK breeders, research organisations and maltsters with the results being freely exchanged within the group. Progress had been such that new improved winter malting varieties could be on the market by 2025. Meanwhile, the loss of chemical seed treatment was creating renewed interest in biological treatments, according to Prof Fiona Burnett of SRUC. The Mains of Loirston Trust is funding trial work into these natural products, known as elicitors, which stimulated the defence mechanisms within plants. They were unlikely to be cheaper than conventional products but could form a useful part of an Integrated Pest Mangement (IPM) system.